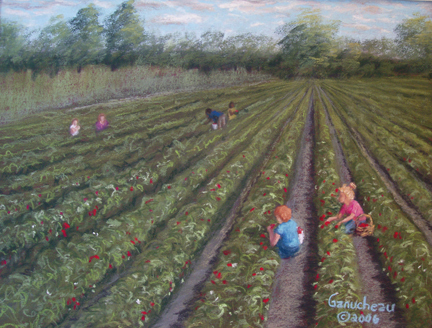 Pastel pleine-aire painting of a U-pick Strawberry Farm in Wilmington, NC by Rose Ganucheau. When we set up our easels to paint the berry pickers at Lewis farms, we were delighted when a bus load of school children pulled up. Seeing their faces full of delight and wonder (not to mention strawberries) was the highlight of the expedition. It's always a special outing for families with strawberry ice cream to top it off.